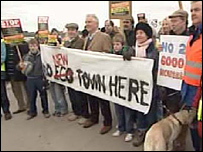 Protesters have demonstrated near the site of a proposed eco-town planned for a former Army camp in Warwickshire. The scheme, for 6,000 new homes at Long Marston, is one of more than 50 similar projects across the UK aiming to create carbon-neutral communities. The government has said it wants at least 10 such towns by 2020. Protesters argue there has not been enough consultation and say the schemes will be an excuse for building houses in inappropriate places. Residents from communities near the proposed sites are among those concerned about the impact they might have. About 200 demonstrators turned up near the proposed site of the Long Marston eco-town on Sunday, carrying placards opposing the site. They fear the new homes will lead to congestion in their villages as the new home owners travel to work and take children to school. Councillor Izzi Seccombe, from Warwickshire County Council, questioned whether developing an eco-town in a rural area would be sustainable. She said: "Eco may be eco within its community, but they all have to travel outside and there is a very large rural area they will have to travel through to get to any employment or major leisure centres or towns. "This area is a thread of very many rural villages. We have a lot of cohesion within those communities. "I believe planning 6,000-plus houses on a piece of paper does not build community cohesion in an instant like that." The remit for the planned eco-towns is that they should be carbon-neutral using the latest environmental design and technology to create more sustainable homes. John Deegan, from one of the developers involved in the Long Marston plans, said: "The proposal is for a completely new settlement involving 6,000 new houses, new secondary and primary schools, lots of new employment. "(There will also be) investment of well over £100m in infrastructure to support the town and to relieve Stratford." Energy for eco-homes should come from renewable sources - wherever possible they will be built using natural, recycled or reclaimed materials. The government wants to build many eco-homes on former industrial - or brownfield - sites to avoid swallowing up countryside or green belt land. Ministers are deciding which of the proposed schemes will be short listed to go ahead. Sunday's protest near Long Marston was one of a string of demonstrations taking place in the run-up to the decision, which is expected later in the month. Communities and Local Government, which sets UK policy on housing and urban regeneration and other matters, has not revealed who has applied for eco-towns, but expects to announce a shortlist soon. A spokesperson said: "No decisions have been taken yet. There will be opportunities for local people to have their say on the proposals before final decisions are taken. "We desperately need more homes and we need to act to tackle climate change. "Eco-towns will deliver more affordable and greener housing through their low and zero carbon technologies." Protests have been held at a proposed site near Gotham, south Nottinghamshire, and opponents of schemes in south Derbyshire and Leicestershire have petitioned Downing Street. Prime Minister Gordon Brown announced his plans for five eco-towns to be built on former industrial sites as he campaigned to succeed Tony Blair at No 10. This was later doubled to 10 eco-towns - a total of 240,000 homes - during the Labour Party conference in September.